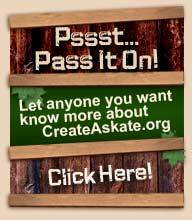 Who can participate in the CreateAskate.org program? 1. Students must be enrolled in a bona fide school (junior, middle, or high school level). 2. CreateAskate.org’s programs are limited to students actively enrolled in woodshop classes and or art or design courses. 3. Students are required to pay a $15 participation fee. 4. Students are encouraged to raise their participation fee ‘independently,’ that is, without relying on parents or relatives. Individual or group activities, including recycling of bottles, glass, or newspapers, or projects like Car Washes or even Bake Sales could be coordinated by the woodshop class or art class. 5. Participation must be coordinated by class teacher and school’s administration, students cannot participate individually. 1. An experience in relevancewhat they do with their skateboard deck upon completion is up to them. 2. All materials, supplies, and instruction necessary to complete one professional quality skateboard deck. 3. Instructions are coordinated by teacher and fellow students via internet, video, and hands-on materials provided by CreateAskate.org. 4. Completed deck’s serial number is registered with CreateAskate.org and entitles student to Certificate of Completion and any and all benefits arising from the CreateAskate.org program. 5. An educational experience, involving mathematics, science, language skills, and design and engineering opportunities in a hands-on real-life, get-a-little-dusty sort of way. The program includes the opportunity for students to work in collaboration with other students while gathering information from internet, video, and instructor sources. 6. The potential of discovering a new creative talent (empowerment).